The briefing was sent to Paula Dobriansky, who in 2001 was the Under Secretary of State for Global Affairs. She was also the head of delegation and the lead negotiator on US climate change policy[NN1]. The document was authored by then Acting Assistant Secretary for The Bureau of Oceans and International Environmental and Scientific Affairs (OES) Ken Brill. 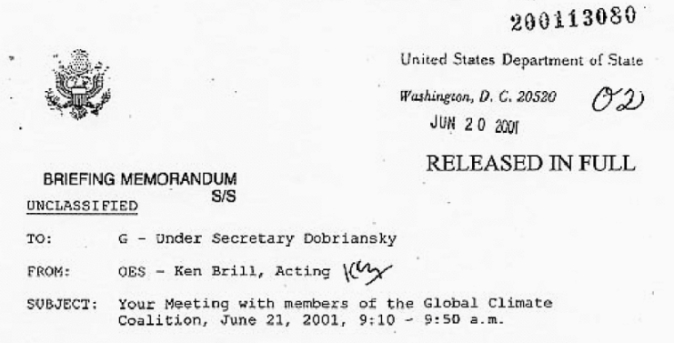 The document provides background information and talking points for Dobriansky’s June 21st meeting with the Global Climate Coalition (“GCC”), a US-based industry group that opposed action to reduce greenhouse gas emissions, promoted the views of climate skeptics, and was actively involved in US opposition to the Kyoto Protocol in 1997. This meeting was one of a series of meetings Dobriansky held with the fossil fuel industry and its representatives in the summer and fall of 2001. The Bush administration was openly curious about what the GCC wanted out of the 6th Conference of Parties (COP), which was scheduled to reconvene one month after the meeting between Dobriansky and the GCC. The GCC delineated some of their priorities in their 21st Century Climate Action Agenda, many of which hinge on voluntary actions, both regarding the environmental standards to which they hold their membership and the commitments made by the US at the climate negotiations. This opposition to binding commitments at the international climate negotiations has long been a trademark of U.S. climate change policy.